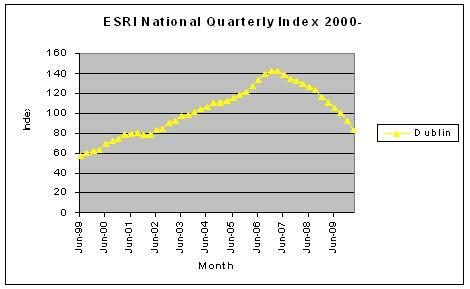 Today sees the publication of the first Permanent TSB/ESRI QUARTERLY house price index which replaces the old monthly index which was suspended following publication of the December 2009 index because of thin sales. The index published today tells us that the price of residential property has fallen by 4.8% since the end of December 2009 to the end of March 2010, ie an average monthly fall of 1.6%. The indication is that the pace of price falls is easing overall. The average price of a property nationwide is now €204,830. 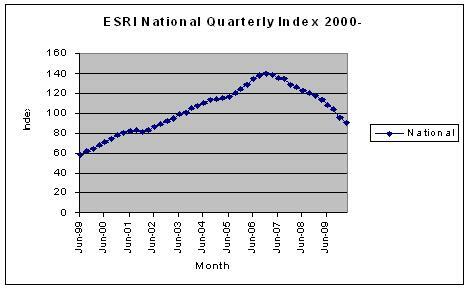 However prices in Dublin crashed 10.3% in the quarter which is worse than the 7.5% fall in Q4, 2009. The National House Price index stood at 91.0 at the end of March 2010. The last time it was at this level was in November, 2002 when it stood at 91.2. The following shows the index since June 1999 at the end of each quarter (Mar, Jun, Sep, Dec). The Dublin House Price index stood at 83.0 at the end of March 2010. The last time it was at this level was in June, 2002 when it stood at 83.3. The following shows the index since June 1999 at the end of each quarter (Mar, Jun, Sep, Dec). The average price of a property in Dublin is now €250,872. 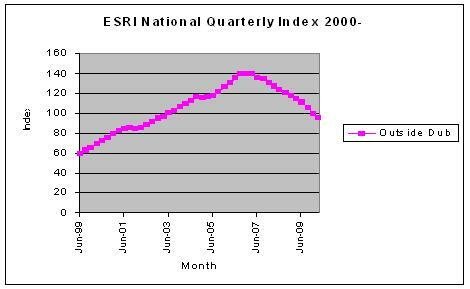 The Outside Dublin House Price index stood at 95.9 at the end of March 2010. The last time it was at this level was in March, 2003 when it stood at 96.3. The following shows the index since June 1999 at the end of each quarter (Mar, Jun, Sep, Dec). The average price of a property is now €183,309. So the key questions : are prices still falling? We don’t know by month but it is certainly the case that prices have continued to fall since December 2009 and the rate of fall between Sep-Dec 2009 (quarter) was 8.5% compared with a fall between Dec 2009 and March 2010 (quarter) of 4.8%. We in Europe are certainly living in interesting times. This all might seem unexpected however in 1995 a former European Union economist Bernard Connolly foretold it all in his classic book “The Rotten Heart of Europe.” Connolly was hounded out of his elite job for telling the truth about the lies and obfuscation about the ERM (Exchange Rate Mechanism), the forerunner of the Euro. He knew that his instincts and training as a professional economist were telling him that the Euro would be a disaster for Nation States yet he was not allowed to articulate his genuine concerns.“As we shall see, in France the long arm of the authoritarian state has pressurized dissident economists and bankers, deployed financial information programmes on international TV channels, threatened securities houses with loss of business if they questioned the official economic line, and shamelessly used state-owned and even private-sector banks, in complete contradiction with their shareholder’s interests and Community law, to support official policy. ………. As the current crisis unfolds we are just beginning to see the flaws in the Euro system that Connolly foresaw. Under the regime yes we have stable exchange rates between the Euro countries but there is no harmony between the disparate economies that make up Euroland. For example when it comes t0 borrowing “sovereign debt” each country is on its own. This last week Greece had to pay 18% on two year money whereas Germany had to pay only 3% approx. Where Greece has gone Spain, Portugal and Ireland are soon to follow. The technical makeup of the Euro is being brought into the glare of the light of day and business functionaries do not like the weaknesses they see. The idea that the Euro has a “central” bank has thus been exposed as a myth. If the Euro actually had a real central bank the sovereign nations of the European Super State would be able to borrow under its aegis, they cannot. Thus it is a political entity not an economic one. The fact that Germany “cannot assist” Greece in these crises while the Euro burns indicates again that politics and power rules the day not bread and butter and families and jobs. The behavior of Germany is actually frightening in light of the fact that it is the major beneficiary of this artificial exchange mechanism. The Euro is allowing cheap German goods flood. Europe and explains why it has 200-300 billion Euros of trade surpluses with its economic partners.In a survey last week over 80% of Greeks want to exit the Euro but this voice is not being reported in much the same fashion that Connolly’s concerns were silenced by elite bankers and politicos. However, in 1995 the world was less connected when the Euro mechanism was being set up. Today we have hedge funds connected through Cray computers ready to “play” the markets. As soon as traders realize the Euro is a one way bet they will opt destroy the exchange mechanism because of its exposed failings. The Emperor has been seen to have no cloths. As sure as night follows day they are going to reap their reward, the same way George Soros reaped his one billion paycheck on the 16th. September 1992 (“Black Friday”) when the bank of England lost 3.4 billion Sterling in one single day defending a flawed exchange link to Euroland. It is my suspicion that Germany sees this as a very real scenario and does not desire to waste its hard won foreign reserves on a “Norman Lamont” (The “Black Friday” chancellor of the British exchequer) type endgame. All of this would be fascinating if it were purely an academic issue, unfortunately it is not. In Ireland, for example, the country is going through a horrendous economic downturn, one which is being exacerbated by this “currency” crisis. The problem is we now know the Euro is not a real currency and confidence is shot. The end result is lost jobs, non-existent credit, frozen business cash flows, unemployment and emigration. In other words the issues are very, very real. And I am sure it is the same in Greece, Portugal, Spain and Italy. I do hope that the powers that be put their heads together to solve this developing disaster. Bernard Connolly wrote about it 35 years ago so they have had a lot of time to prepare. Let’s hope wisdom prevails and that the lessons Argentina learnt nearly a decade ago can be used. In that crisis, when she had to break the link to the Dollar (a la our Euro) she allowed devaluation but inspiringly its leaders also insisted the devaluation of all Dollar loans. In doing so the elite realized that they had only two options. Social catastrophe or neutered bankers. They took on the bankers and substantially diminished the debt. Thus they saved their nation. Accordingly, the so called “PIIGS” countries; Portugal, Italy, Ireland, Greece and Spain, should form a league based on national economic restructure. This league should form a common secretariat with the purpose of negotiating an exit from the Euro and allowing their currencies to “float” once more. This will immediately allow their economies to become competitive again without widespread deflation. Most importantly all Euro loans must be devalued to a new negotiated exchange conversion, as per the Argentinean model. This action will be greatly resisted by Euro bankers. This is why no one European nation could go this route alone. But together in league they have a chance. I hope Irish leaders realize the difficulty we are in and have the intelligence and wisdom to formulate the type of solution mentioned. If such leadership was shown by Ireland perhaps the other heads in Portugal, Italy, Greece and Spain would have the courage to join with their fellow European brothers and sisters and save their nations from certain financial destruction. Yes we truly are living in interesting times. "The Rotten Heart of Europe." RTÉ presenter Gerry Ryan has been found dead at his apartment in Dublin. The alarm was raised after Ryan (53) failed to show up this morning for the 2fm radio show he has presented since 1988. He was found at his apartment in Ballsbridge. The cause of death is unknown at present but foul play is not suspected. In addition to his popular radio programme, the controversial broadcaster presented a host of television programmes, including Ryan Confidential, Gerry Ryan Tonight, Ryantown, Gerry Ryan’s Hitlist and Operation Transformation. He co-presented the 1994 Eurovision Song Contest from Dublin’s Point Theatre and replaced Pat Kenny for an edition of The Late Late Show in 2008. He published his autobiography – Would the Real Gerry Ryan Please Stand Up – in 2008. There are no good solutions here, only very difficult ones. In order to get financing, Greece must willingly put itself into a multi-year depression. And borrowing more money when it cannot afford to pay back what it has will not solve the problem. 61% of Greeks now favor leaving the euro. How has Greece responded? By banning short selling on its stock market for the next two months. That should make things better. Greeks are responding by rioting and going on strike. But you truly know when a country is dysfunctional when its AIR FORCE goes on strike. Yesterday Reuters reported that hundreds of Greek pilots called in sick in protest. The response from government? The Minister of Defense said he was “profoundly disappointed.” Now that had to make the pilots feel bad. Money is flying from Greek banks, which makes sense, as how can a bankrupt Greek government guarantee Greek bank deposits? I know that Greek bankers may have a different view, but Greek depositors are voting with their feet. And Greg shows us it is not just Greece. It is fast becoming Portugal. And Spain is not far behind in my opinion. I want to thank Greg for letting me send this on to you. His website is http://www.weldononline.com. This letter is typical of his work – thorough and detailed and full of charts. He is the best slicer and dicer of data that I know. … “We are basically trying to change the course of the Titanic. People think we are in a terrible mess. And we are. Thinking that the problems of Greece, let alone two dozen other European debt-deficit ‘offenders’, will be ‘solved’, without PAIN, quickly … or that they will be easily and quietly ‘papered-over’ … is like playing Three Card Monty with the hustlers of Eighth Avenue in Manhattan. It is ALWAYS a LOSING proposition. Now, over two months later … the Titanic is SINKING … amid today’s credit rating downgrade announced by Standard and Poor’s, as it relates to Greece’s sovereign debt. In short, it is NOT, at all … “all over now”, in Europe. … bailouts-that-are-not-a-bailout that would be significantly LARGER than the 45 billion EUR offered to Greece … what then ???? Again, as we have stated repeatedly since the 4Q of last year … Europe’s fiscal debt-deficit crisis is FAR from ‘over’. Again, as we have repeatedly stated … it will not be over, until draconian fiscal austerity measures are implemented ACROSS the region. It will not be over … for years to come. Indeed, the ICEBERG is HUGE … and the unsinkable ship is sinking !!! Evidence the rising water levels in the engine room, as represented by the ‘price’ of default ‘protection’, evidenced in the chart below plotting Greece’s 5-Year Credit Default Swap Rate … which has SOARED today, easily reaching a NEW ALL-TIME HIGH … by FAR !!! In fact, in our March 22nd Money Monitor entitled “Three Card Monty, Revisited”, we offered a chart perspective on the 5-Year Greek CDS. We spotlighted the downside correction that took the CDS to the med-term trend defining 100-Day EXP-MA, in line with a text-book Fibonacci retracement (between the 38% and 50% retracement levels) … suggesting that the downside correction provided a ‘buying’ opportunity. After today’s parabolic rise in the 5-Year Greek Bond yield, as noted below, the word ‘increases’ becomes a substantial understatement. … and, the National Bank of Greece, both of which are breaking down technically, following a rally that mapped out another ‘text-book’ Fibonacci retracement correction. Hence we turn the spotlight on the Greek stock market as a whole, represented within the chart below in which we plot the Greek ASE stock index. Indeed, we note another Fibonacci retracement, to the 33% target, followed by this week’s renewed technical breakdown. The ship … is going DOWN. We have been bearish on the Eurocurrency since October-November of last year, and after suffering because we were ‘early’ to this thematic-trade, we have been rewarded for our patience and perseverance … as evidenced in the longer-term daily chart on display below, revealing today’s decline in the EUR to a new move LOW. Further, we spotlight the bearish technical dynamic, as defined by the negative action in the moving averages, and the slide into bearish territory by the long-term 200-Day Rate-of-Change. … as observed in the long-term weekly chart seen below. We are now watching for a ‘confirming’ upside breakout in the spot (USD based) price of Gold. Noting the daily chart on display below we focus on the most recent re-acceleration to the upside in the med-term trend defining 100-Day EXP-MA. An upside violation of the April 12th high of $1169 would constitute a full-blown med-term upside breakout. All ‘passengers’ are going down with the ship … with a downgrade to Portugal’s sovereign credit rating also announced today, as Standard and Poor’s marked down Portugal’s rating by two notches, from A+ to A-, while placing the country on a negative outlook watch, portending more downgrades in the future. Subsequently, Portugal’s 5-Year Credit Default Swap is SOARING, as noted in the chart below, spiking to a NEW ALL-TIME HIGH … today. Similarly, Portugal’s 5-Year Government Bond yield SOARED to a NEW HIGH, jumping by + 60 basis points today alone, capping a monstrous +215 basis point rise in the month of April, easily violating the February high of 3.95% … as evidenced in the chart below. … as evidenced in the daily chart on display below, replete with technical breakdown, head-and-shoulders pattern, violation of the med-term trend defining 100-Day EXP-MA … and … the downside reversal by the moving average itself, directionally speaking. … and thus we note the chart on display below as Spain begins to unravel too, with the 5-Year Credit Default Swap SOARING to a NEW ALL-TIME HIGH, slicing through the (previous) double-top formed as defined by the February 17th, 2009 high at 170 basis points, and the February 8th, 2010 high at 173 basis points, reaching towards 200 basis points. And, we shine the spotlight on the chart below plotting Spain’s 5-Year Bond yield, which is breaking out to the upside, today, and doing so ‘from’ historically low levels below 2.75%, violating the February 5th high of 3.13%. The Titanic is sinking, and ultimately, ALL passengers will go down with the ship, including Portugal, Spain, Greece, and several other Maastricht Treaty debt-deficit offenders. Die Idee klingt so einfach wie verlockend: Weil Banken mit griechischen Anleihen gezockt haben, sollen sie sich an der Rettung des Pleitelands beteiligen, verlangen viele Politiker. Eine Milchmädchenrechnung – denn betroffen wären vor allem Institute, die ganz oder teilweise dem Staat gehören. Es ist mittlerweile ein natürlicher Reflex: Wenn es um die finanziellen Folgen der Finanzkrise geht, rufen Politiker nach der Beteiligung der Finanzbranche. So auch in Sachen Griechenland: Da ist mittlerweile manch ein Volksvertreter der Meinung, der Krisenstaat könne nur noch via Umschuldung gerettet werden. Das würde bedeuten: Griechenland einigt sich mit seinen Gläubigern darauf, nur einen Teil der Kredite zurückzuzahlen. Eine Umschuldung fordert auch der CSU-Finanzexperte Hans Michelbach, der großspurig eine internationale Gläubigerkonferenz einberufen möchte. Und in diesem Zusammenhang natürlich auch erwähnt, dass die Finanzbranche bei der Rettung des hellenischen Schuldenstaats ihren Beitrag leisten müsse. Auch der nordrhein-westfälische CDU-Ministerpräsident Jürgen Rüttgers findet, es müsse genau geschaut werden, “wer die Zeche bezahlt”. Er will die Banken ebenfalls für Griechenland zur Kasse bitten. Ein Wunsch, den trotz der anstehenden Landtagswahl selbst SPD-Chef Frank-Walter Steinmeier unterstützt. Die Botschaft der Politiker ist klar: Diejenigen, die sich mit griechischen Staatsanleihen verzockt haben, sollen nun auch die Kosten tragen. Doch dem wohlklingenden Appell liegt zumindest teilweise eine Milchmädchenrechnung zugrunde. Denn in Deutschland haben nach jetzigem Kenntnisstand ausgerechnet die Banken viele Griechenland-Papiere in ihren Büchern, die dem Staat ganz oder teilweise gehören: Die Hypo Real Estate (HRE) und die Commerzbank. Die HRE – die mittlerweile Deutsche Pfandbriefbank heißt und mit rund 100 Milliarden Euro gestützt wird – kam zum 31.12.2009 auf ein Volumen von 7,9 Milliarden Euro an griechischen Staatsbonds. Bei der Commerzbank sind es etwa drei Milliarden. Auch einige Landesbanken sind betroffen. Bei der BayernLB etwa sprechen Finanzkreise von einem Engagement in Höhe von 300 Millionen Euro. Auch sonst ist das Risiko einer Umschuldung – die Bankenprofessor Burghof als “euphemistische Beschreibung eines Staatsbankrotts” charakterisiert – schwer zu kalkulieren. Viele deutsche Geldinstitute geben sich reichlich verschlossen, was ihr genaues Engagement in Griechenland betrifft. Bei der Landesbank Baden-Württemberg will man sich zu einzelnen Posten des Portfolios generell nicht äußern, bei der Hessischen Landesbank spricht man von einem “äußerst geringen” Betrag im mittleren zweistelligen Millionenbereich. Und die Zahlen, die man bekommt, stimmen nicht unbedingt optimistisch. Insgesamt, so heißt es bei der Bank für internationalen Zahlungsausgleich, schuldet Griechenland deutschen Geldinstituten rund 43 Milliarden Euro. Die Allianz erklärt, die gesamte Gruppe habe mit Stichtag 31. Dezember etwa 3,5 Milliarden Euro an griechischen Staatsanleihen in den Büchern. Bei der Münchner Rück waren es Ende 2009 rund 2,2 Milliarden Euro. Die Veröffentlichung des “sehr, sehr ernsthaften” und glaubwürdigen Programms werde an den Finanzmärkten Vertrauen schaffen und die Zinsaufschläge bei griechischen Staatsanleihen reduzieren, ist Buti überzeugt. Das Programm werde über einen Zeitraum von drei Jahren Einsparungen und tiefgreifende Strukturreformen vorsehen. Bankenprofessor Burghof allerdings findet, eine Umschuldung wäre trotz aller Risiken “ehrlicher”. Dort wo das Risiko eingegangen wurde, würde es auch abgeschrieben: in den Büchern der Banken. Zu den stärksten Verlierern im Dax gehörte absurderweise die Deutsche Bank. Die Aktien von Deutschlands größtem Geldhaus verloren zeitweise um fast fünf Prozent an Wert – dabei hatte der Konzern am Dienstag glänzende Quartalszahlen vorgelegt. Doch die Börsianer störten sich nicht nur an einem ausgesprochen zurückhaltenden Ausblick von Finanzchef Stefan Krause – auch die Belastung durch die Übernahme von Sal. Oppenheim sorgt die Finanzexperten. Denn durch die erstmalige Einbeziehung der Kölner Privatbank schmolz die Kernkapitalquote von Dezember bis Ende März von 12,6 auf 11,2 Prozent. Damit liege die Deutsche Bank am unteren Ende im Vergleich zu ihren Wettbewerbern, kritisierte Unicredit-Analyst Stefan Stalmann. Börsianer machen sich daher Sorgen, ob die Bank nicht doch mehr Kapital braucht. Immerhin: In der Debatte um eine mögliche Griechenland-Pleite kann sich Deutsche-Bank-Chef Josef Ackermann, der sonst oft als Vorzeige-Buhmann der Bankenbranche herhalten muss, entspannt zurücklehnen. Sein Haus hat nach eigenen Aussagen mit der ganzen Sache wenig zu tun. Question 50: To ask the Minister for Finance if he will estimate losses over a three year horizon by the guaranteed credit institutions on that portion of their loan books not destined for the National Asset Management Agency; and if he will make a statement on the matter. It is a matter for the Board of each and Management of each institution to assess and make public as appropriate forecasts for future losses. As Minister, I don’t make such forecasts but I do expect the Financial Regulator will make its own assessment of capital needs of banks, having regard to both expected and potential losses and appropriate capital levels. New capital levels have recently been set by the Financial Regulator to ensure that the banks can maintain appropriate capital levels and withstand future losses, even under very stressed conditions. These are contained in the Prudential Capital Assessment Review published recently. As Minister, I have already indicated the steps that the Government is taking to ensure that the banks can meet their capital requirements. We have already started to put these measures into affect, in relation to Bank of Ireland. The House will agree with me that the fact that this bank can raise significant private capital is a real sign of stabilisation and recovery in the sector. There is much further work to be done to build on this significant step. The Regulator requirement is that a level of 8 per cent of core tier 1 capital is to be attained by the end of the year. This level of capital must be met after taking account of future losses, from both NAMA and non-NAMA portfolios. This capital will be principally in the form of equity – a 7 per cent equity requirement. Equity is the highest quality form of capital, and the emerging international standard. In addition, further amounts, specific to each institution, are to be added on in the calculation of future loan losses. The new requirements also mean that banks cannot go below a level of 4% core tier 1 capital in a severely stressed scenario. The Governor of the Central Bank, Patrick Honohan considers that the actions and announcements at the end of last month create a secure platform on which confidence in the banking sector will be built. The Financial Regulator has accepted that it is important that our banks move to a strong capital position as soon as possible and that we draw a line under the Irish banking crisis. Sufficient capital is an essential ingredient to ensure that banks can withstand future losses. He has applied a robust, realistic and prudent capital standard informed by his own detailed analysis and by emerging best practice internationally. The stress test requirement is based on a severe scenario of hypothetical adverse macroeconomic conditions and therefore involves an element of judgment. The stress test inputs do not represent a forecast of likely economic developments by the Central Bank and Financial Regulator, instead they are much more adverse than what is considered likely. Question 87: To ask the Minister for Finance the position regarding the status of a company (details supplied); the number of entities that have expressed an interest in acquiring the insurance part of the company; the steps that are being taken to ensure the greatest possible protection of the employees; and if he will make a statement on the matter. As the Deputy will be aware, on 15 April, the High Court appointed full time administrators to Quinn Insurance Limited. This follows Quinn Insurance Limited’s (QIL) decision to consent to the appointment made by the High Court on application made by the Financial Regulator. It is the Financial Regulators and QILs opinion that this step is in the best interests of policyholders. It means that the company is able to pay claims and renew policies in the normal way here in Ireland and continues to settle claims in the UK. It also puts the business on a sound commercial and financial footing and this best serves the proper and orderly regulation of QIL and the wider insurance market. I am conscious of the position of employees of Quinn Insurance as a result of the appointment of the joint Administrators to the company. I am aware that a key element in safeguarding employment in Quinn Insurance is the re-opening of its UK business. In this regard, I welcome the decision by the Financial Regulator to allow the company to write motor insurance cover, for provisional driver licence holders in the United Kingdom including Northern Ireland with effect from 22 April. This is an important first step in ensuring that the value of the business is maintained as it enhances the prospect of the Administrators being able to sell the firm as a going concern. The submission of detailed business plans and proposals in relation to re-opening further lines of business in the UK is a matter for the Administrators. The Financial Regulator has informed me that it has been engaged with the Administrators in recent weeks and is giving all proposals full consideration. Before making any decision on this matter the Financial Regulator will have to be satisfied that any proposals stand up to scrutiny and are supported by robust and detailed information, actuarial analysis and pricing. The Government remains concerned about the position on employment in QIL generally. That is why the parties involved must continue to work to find a solution that addresses the issues of putting the company back on a sound commercial and financial footing. This is the best way of protecting jobs and the wider interests of the taxpayer. The administrators have said that they will continue to engage constructively with staff and management at the company as they endeavour to secure its future. In that context, I understand they will be meeting with staff representatives on Friday, 30 April to advise them of their decision on what measures are necessary in relation to employment levels as part of the recovery plan for the company. I cannot comment directly on the issue of the number of companies that have expressed an interest in acquiring Quinn Insurance as this is a matter for the Administrators rather than my Department. I am aware however, that the Administrators have indicated that a significant number of companies have expressed an initial interest in the company. A complete analysis of the financial position of the company is still being carried out by the Administrators and this must be completed before there is further progress here. Finally, in relation to the broader Quinn Group, I have been informed by my colleague Mr Batt O’Keeffe, the Minister for Enterprise, Trade and Innovation that the Chairman and Chief Executive of Enterprise Ireland met with the senior management of the Group earlier this month. He has indicated that Enterprise Ireland stands ready to provide all possible support to the company with a view to maintaining the maximum number of jobs when the company’s position is clarified in the period ahead. Want to know more about Goldman sacks?